Date: Aug 31 2018, 7 p.m.
We are excited to announce our Labor Day Weekend Celebration! The celebration includes a FREE concert at the Polo Field on Friday, August 31 and a FREE Airshow on Saturday, September 1. Gates open at 6 p.m. Show starts at 7 p.m.
You asked and we listened, you won't be hearing country music at this concert. 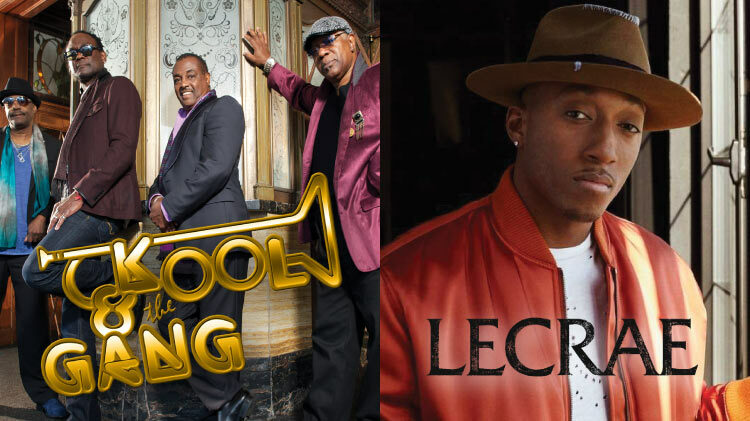 Instead, we're taking a groovy/funky/80's trip down memory lane with Kool and the Gang and a contemporary stroll into the world of southern hip-hop with Lecrae. Special guest Texas DJ, Black Rhino Sound, will get the party started. You've heard their songs Celebrate!, Ladies Night, and Cherish before, but don't miss the opportunity to hear Kool and the Gang live in concert! Kool & the Gang have influenced the music of three generations. Thanks to songs like "Celebration," "Cherish," "Jungle Boogie," "Get Down On It," and "Joanna," they've earned two Grammy Awards, seven American Music Awards, 25 Top Ten R&B hits, nine Top Ten Pop hits, 31 gold and platinum albums, and, most recently, were inducted into the Songwriters Hall of Fame which is no easy feat. Kool & the Gang has performed continuously for the past 43 years, longer than any R&B group in history. Their bulletproof funk and jazzy arrangements have also made them the most sampled band of all time. Kool & the Gang's drum beats, bass, guitar and signature horn lines lace the tracks of numerous artists including the Beastie Boys, Jay-Z, Madonna, Janet Jackson, Cypress Hill, and P. Diddy. Kool & the Gang has continued to tour the world appearing with artists such as Kid Rock, Dave Matthews Band, Elton John, The Roots and a 50-city tour with Van Halen. Critics have praised the authenticity and heightened sensitivity toward the disenfranchised of Lecrae's work. Such authenticity has been the hallmark of his 7 studio albums and multiple mixtapes, now nearing the 2 million mark in sales, with Lecrae winning 2 Grammy Awards, Billboard Music Award, multiple BET, Soul Train, and Dove awards and even an Honorary Doctorate of music. His work includes "Blessings" featuring Ty Dolla $ign, a Top 10 Urban radio hit, and the powerful track "I'll Find You" featuring Tori Kelly. His first mixtape, Church Clothes, had over 100,000 downloads in less than 48 hours. His album, Gravity, debuted as the best-selling album overall in the iTunes Store and No. 3 on the Billboard 200. His album, Anomaly, debuted as No. 1 on the Billboard 200. Continue the Labor Day Weekend Celebration at the 100th Anniversary of the Henry Post Army Air Field Air Show on Saturday, September 1. Were you bummed that the Air Show was cancelled in April? We were, too. Everything happens for a reason. Because we had to reschedule, we were able to plan an even better air show for the 100th year anniversary of the Henry Post Army Airfield which is the oldest airfield in the army. This is your chance to see historic aircraft. The air show will feature over 20 aircraft displays, 15 flight demonstrations, Field Artillery and Air Defense Artillery displays, a Kid Zone, and more! Bring the whole family and lawn chairs to enjoy this historic event.